PETE BUTTIGIEG does a good line in self-deprecation. He knows that many voters do not know who he is. On the stump he describes how a woman at an airport asked if he was a reporter covering a political campaign. He jokes about his lack of physical height. He speaks of the “audacity of someone like me”, meaning a 37-year-old mayor of a smallish city joining the 2020 race for the presidency. He also tells crowds he is not a “prototypical candidate”, saying his youth is a virtue that makes him focus on long-term concerns, like climate change. For a man with a hard-to-pronounce Maltese name and little experience of national politics, Mr Buttigieg is enjoying an extraordinarily good start to his campaign. His political memoir is selling fast. Television news shows and other media are following him closely. That interest is driven in part by the novelty of his having a husband, Chasten. 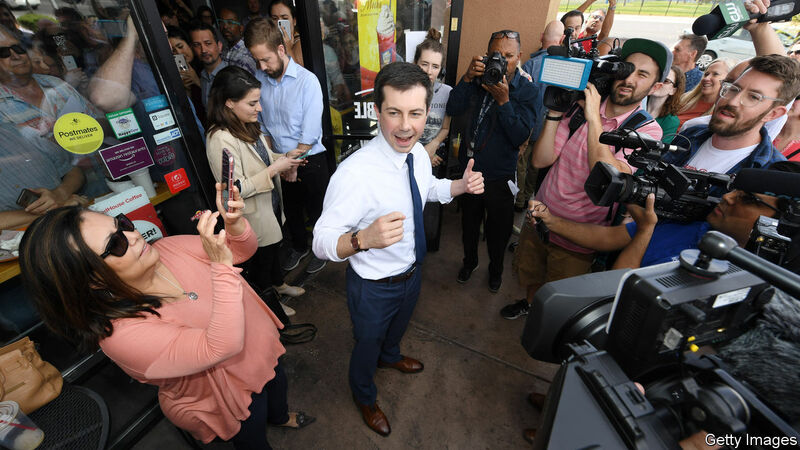 Mr Buttigieg has been on the road and fundraising for weeks but will formally launch his campaign on April 14th in South Bend, the city in Indiana where has been mayor since 2012. On April 11th he received his first serious endorsement, from Steve Grossman, a former chairman of the national Democratic Party and a well-known political figure in Massachusetts. Mr Grossman will no doubt encourage more donors to give to the campaign. Mr Buttigieg has already raised a decent $7m, a figure that includes many small donations, a hallmark of a serious candidate. He mentions, over a beer in a New Hampshire brewery, that he now has the means to expand his campaign team across several states, and notes that everything is moving faster than he had expected a few weeks ago. He says he is braced for a “marathon, not a sprint”. Polls show voters warming to him. Bernie Sanders and Joe Biden (who has not yet declared) are consistently ranked in the lead in the Democratic race, but Mr Buttigieg seems to be jostling for the third spot in a crowded field. A poll in Iowa, published on April 11th, gave him 9% overall support. That rises to 12% among voters who are under 50 and 12% among respondents with a college degree. That is a big shift: three months ago Mr Buttigieg did not register among pollsters at all. The veteran, who served in Afghanistan, is proving to be a capable campaigner and a strong orator. With his measured speaking style he can sound a bit like Barack Obama (who, he sometimes reminds his audiences, described him once as a future prospect for the party). As a participant in televised debates between Democratic candidates later this year he is likely to perform well. Much of the recent interest in him was sparked when he spoke eloquently at a town-hall meeting broadcast by CNN in early March. At recent events in New Hampshire the crowds were large. When an art gallery in Manchester overfilled with 300 guests, he addressed the roughly equal number that had gathered outside. Standing on a bench he spoke about freedom, security and democracy. He also touched some emotional notes, mentioning his father’s recent death and the loving support of his husband. He repeated the performance inside. The rise of long-shot candidates from outside Washington has a long tradition. Bill Clinton’s jump from governor of Arkansas to Democratic nominee in 1992 surprised many. Jimmy Carter, who had been governor of Georgia, was little known before his successful run in 1976. His clean-cut, God-fearing, small-town, virtuous persona appealed to many after the Nixon presidency. Mr Buttigieg also emphasises his Christian faith and small-town virtues, playing up his distance from Washington. He talks, earnestly, of a public yearning for moral national leadership, saying “people are ready for something different” and it is time for “decency, honesty”. How far can this carry him? The fact that Mr Buttigieg is openly gay is, on balance, an asset—progressive Democrats can less easily shun him as a white man who studied at Harvard and Oxford before working as a consultant for McKinsey. At the same time, his identity as a Christian, married, with business and military experience, all suggest he could be popular among more centrist Democrats. He has weaknesses. Just over a quarter of South Bend’s population is African-American, but he has so far said little about their needs as unusually poor community. In his memoir he describes a battle to rename one avenue after Martin Luther King Junior, but mentions little else about African-Americans there. He has tried reaching out to black voters, for example by saying he would support the study of reparations for descendants of slaves. But it is unlikely African-Americans would see him as their most powerful champion. He has also been a bit shy about which policies he would make his own. He suggests there is little variation between Democrats on policy, saying it matters more to talk of values and aspirations rather than offer up a “14-point plan” for every policy area. He mentions issues—such as cyber security and climate change—that matter to him. But he is not ready to spell out in detail how he would address them. Before long he will have to do so.